As the whole world knows, on April 24,1915, the murderous process of Armenocide, that had started almost 50 years earlier, culminated into the horrendous bloodletting of the very first genocide of the 20th Century. Cloaked behind the dust and smoke of the Great War, after the Ottoman Turks completed the slaughter of one and a half million Armenians, Kemalist Turks, side-stepping the 1918 Armistice, defying and ignoring international peace treaties and protocols, with the assistance of several great powers devised and followed their own murderous roadmap. Over the following three chaotic years, they succeeded to decimate surviving Armenian communities from Smyrna to Adana, from Shoushi to Baku, and to reduce a fairly large, fledgling Armenian independent state into a diminutive province of the Soviet Empire. To this very day, succeeding governments of the Turkish Republic – true heirs of that now defunct ”Sick Man of Europe”, the Ottoman Empire – continue, unabated, the same policies of persecution against Armenians, bordering on the genocidal within their own ill-gained boundaries through institutionalized harassment and forced assimilation. Thus, along with a cynical denial of the Armenian Genocide, Turkey, has chosen to perpetuate that same genocidal process which, come next April, will complete its 95th year. With these undeniable facts as a backdrop, the Turkish-Armenian negotiations for the ‘normalization’ of relations between the two countries and the opening of borders were carried on behind a thick veil of secrecy and misrepresentation. Orchestrated by Switzerland – with the active participation and enormous pressure exerted by Turkish oriented special interests in the United States and the European Union — the Armenian side was sure to end up with the short end of the stick. And sure enough, the resulting protocols, drafted without the representational participation of the Armenian people, paved the way for a ‘road map’ that can lead only to the demise of the Armenian Cause in its major aspects – namely, the recognition of the Armenian Metz Yeghern as Genocide with proper restitution, and the rejection of the shameful and untenable terms of the Kars Treaty, which imposes on Armenia her present boundaries with Turkey. The political aims of the opponents of our nationhood and sovereignty are clear and relentless. They are articulated with an ambitious slogan: “The 21st Century will be known as the Turkish Century!” This may sound like wishful thinking, but no one can accuse it of lacking in vision, direction, and national purpose. Against this gauntlet, hurled at the face of our national existence, at this critical juncture of our history, both Homeland and Diaspora — lacking in unity and common purpose — are being offered, by our own government, a policy that suggests nothing more than “Survival at Whatever Cost” — a call to mere existence. The truth is that our nation, engaged in a life and death struggle against powerful opponents needs, above all, the unity of Homeland and Diaspora, gathered around a common national struggle based on immutable historical rights. 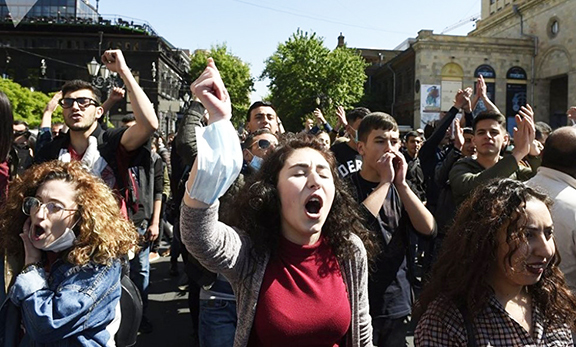 The present stance of the government in Yerevan, alienated from its own people, now following foreign-conceived roadmaps, has simply nowhere to go — for a call to mere existence based on denial of history offers no direction, and no vision of any kind; it merely perpetuates a status quo that threatens our very existence as a viable nation. At this juncture, now that we stand on the crossroads of history once more, being led to the slippery road of accommodating our avowed enemy who is knocking on the doors of Europe, begging to be admitted in the European Union, in need of our cooperation to succeed, we must not lay down our weapons in abject defeat. On the contrary, we must reassess our own stance, and the true intentions of our opponents. We must objectively evaluate the methods of reactivation of our national Cause pursued relentlessly over the last 34 eventful years, starting with the global commemoration of the 50th anniversary of the Genocide, whose veracity is now being put to the test by protocols signed by a misguided government of oligarchs who have, in truth, ceased to represent the Armenian people. Let this be a wakeup call to all Armenians around the world, to step back from the precipice and rally around the banner of our national struggle for justice too long denied, for a future with honor that befits a nation that has crossed the millennia with its unique culture and civilization.